French President Jacques Chirac will arrive in St Petersburg on Friday for a two-day working visit on the invitation of the Russian President Vladimir Putin, Russian media has reported. Interestingly, German Chancellor Gerhard Schroeder is due to visit St Petersburg on the same days. 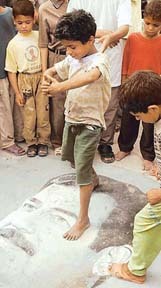 Local Iraqi children stand on an image of Saddam Hussein in Basra on Tuesday. The Red Cross today said it was temporarily suspending its operations in Baghdad after two of its vehicles were hit by gunfire and one of its staff members went missing. Arab Nations have formally asked the 191-member UN General Assembly to convene a special meeting to adopt a resolution calling for ceasefire in Iraq and respect its sovereignty and territorial integrity. 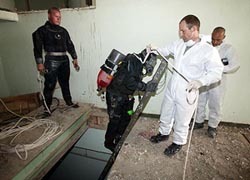 Allied forces divers and chemical weapons experts examine a former base of Saddam Hussein's cousin Ali Hassan al-Majid, nicknamed 'Chemical Ali', near the city of Basra on Wednesday. The US military today said 11 Afghan civilians had been killed by U.S.-led coalition bombing in eastern Afghanistan. Three persons, including an Army Major and his wife, have been found guilty of cheating their way to the top prize on the popular TV quiz, “Who Wants To Be A Millionaire?” Charles Ingram, 39, used coded coughs given by his college lecturer accomplice to help select answers, Judge Geoffrey Rivlin QC ruled in London’s Southwark Crown Court. French President Jacques Chirac will arrive in St Petersburg on Friday for a two-day working visit on the invitation of the Russian President Vladimir Putin, Russian media has reported. Interestingly, German Chancellor Gerhard Schroeder is due to visit St Petersburg on the same days. The three countries have emerged as vocal opponents of the US-led attack on Iraq. United Nations Secretary General, Mr Kofi Annan, will attend the European Union conference to be held in Greece next week to discuss post-war Iraq. Mr Putin has also been invited to the Athens. The meeting will begin on April 16, but Mr Annan is expected to attend only on April 17. A UN spokesman said Annan has declined to attend a weekend meeting Putin is hosting in St Petersburg. France is satisfied and Japan has welcomed the statement in which US President George W. Bush and British Prime Minister Tony Blair said the United Nations should play a vital role in a post-war Iraq. “France is of course pleased at the stance that has been taken by President Bush and Prime Minister Blair,” de Villepin, French Foreign Minister told reporters after talks here with his Kuwaiti opposite number, Sheikh Sabah al-Ahmad al-Sabah in Paris Tuesday. “We praise (the talks) as they mentioned an important role by the United Nations and expressed support for an early establishment of the government by Iraqi people,” Japan’s Chief Cabinet Secretary Yasuo Fukuda told a news conference in Tokyo. Britain has appealed for closer defence ties with Germany. British Defence Secretary Geoff Hoon told this to journalists after talks with German counterpart Peter Struck Tuesday. The International Committee of the Red Cross (ICRC) in a statement from its Geneva headquarters said a Canadian aid worker was missing and was feared seriously injured following the incident today, when his car was either attacked or caught in crossfire. A spokesman in Jordan said the ICRC, one of the only international organisations working in the Iraqi capital, was suspending its activities in Baghdad because of the fighting. “The precarious and dangerous situation and the chaos which reigns in Baghdad obliges the ICRC, with regret, to suspend its activities temporarily in the city,” ICRC spokesman Moin Kassis said. “We regret we cannot give help to those who need it in these circumstances,” he added. The Canadian staffer, Vatche Arslanian, was missing and was feared seriously injured after two vehicles clearly marked with the Red Cross were either attacked or caught in crossfire, the ICRC said in Geneva. Two other staff members who were in the cars managed to escape and raise the alarm, it said. The Arabs sent in their request yesterday after a closed-door meeting of 116-member Non-Aligned Movement (NAM) failed to develop a consensus on seeking the session. “Eleven Afghan civilians were killed and one was wounded early this morning when a bomb dropped by coalition aircraft landed in a house on the outskirts of Shkin near the Pakistan border,” said Mr Douglas Lefforge, US military spokesman at the Bagram air base north of Kabul. Charles Ingram, 39, used coded coughs given by his college lecturer accomplice to help select answers, Judge Geoffrey Rivlin QC ruled in London’s Southwark Crown Court. Ingram’s wife Diana, a nursery nurse, and Tecwen Whittock, 53, head of business studies at Pontypridd College, South Wales, were among the three convicted after almost 14 hours of deliberations over three days. Diana, also 39, was found guilty of helping to “set up” the scam. The Ingrams were sentenced to 18 months in prison, suspended for two years, and each fined £ 15,000 and ordered to pay £ 10,000 in costs. Whittock was sentenced to 12 months in prison, also suspended for two years, and was fined £ 10,000 pounds and ordered to pay £ 7,500 in costs. The court heard that the Ingrams and Whittock had been in contact by phone on a regular basis for several months before Ingram’s winning show. But they ignored each other at the studio. 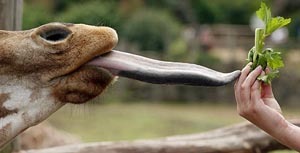 Whittock admitted that he had a cough at the time and a number of people in the audience noticed it. But he insisted that he had not coughed to help Ingram with the answers. A ministry of Defence spokesman said Ingram’s conviction did not mean automatic expulsion from the Army. An internal investigation would be carried out.